Organic photovoltaic systems have undergone rapid development during the last few years. In most cases, organic solar cells consist of two layers of semiconductors—one acts as the donor by supplying the electrons, and the second acts as an acceptor or electron conductor. In contrast to the silicon conventionally used, which must be drawn from a melt or precipitated in vacuum systems, the polymer layers in this system can be deposited from a solution directly on a supporting film. On the one hand, this means comparably low manufacturing costs, and on the other, these flexible modules can be used more easily than silicon solar cells in urban spaces. For a long time, fullerenes, which are carbon-based nanoparticles, were considered ideal acceptors, but the intrinsic losses of fullerene-based composites still severely limit their potential efficiency. The work carried out at FAU has thus resulted in a paradigm shift. "With our partners in China, we have discovered a new organic molecule that absorbs more light than fullerenes that is also very durable," says Prof. Dr. Christoph Brabec, Chair of Materials Science (Materials in Electronics and Energy Technology) at FAU. "Significant losses frequently occur during scaling," says Dr. Ning Li, a materials scientist at Prof. Brabec's Chair. During a project funded by the German Research Foundation (DFG), Ning Li and his colleagues at SCUT in Guangzou were able to significantly reduce these losses. In a complex process, they adjusted the light absorption, energy levels and microstructures of the organic semiconductors. The main focus of this optimisation was the compatibility of donor and acceptor, and the balance of short-circuit current density and open-circuit voltage, which are important prerequisites for a high output of electricity. "I think the best way to describe our work is by imagining a box of Lego bricks," says Li. "Our partners in China inserted and adjusted single molecular groups into the polymer structure, and each of these groups influences a special characteristic that is important for the function of solar cells." 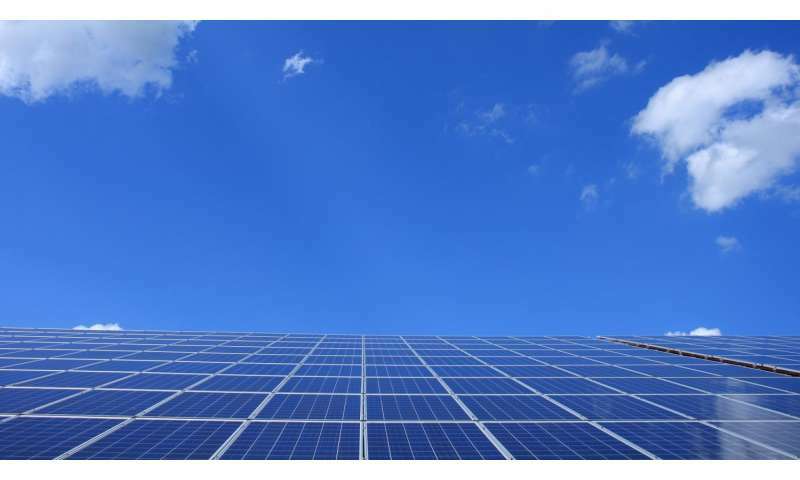 This results in a power conversion efficiency of 12.25 percent—a new certified record for solution-based organic single-junction solar cells with a surface area of one square centimetre, where the acceptor does not consist of fullerenes. It is also interesting to note that the researchers succeeded in keeping the scaling losses to such low levels that the highest value in the lab on a small surface was only marginally under 13 percent. At the same time, they were able to demonstrate a stability relevant to production under simulated conditions such as temperature and sunlight.